​The Skull of Gaius Zhuta: Gaius Zhuta was a pious native of Maena who resisted the darkness that came to consume his world, and payed for his defiance with his life. The Sith Mistress Xiangu kept the man's skull long after he had perished, painstakingly reshaping his skull with alchemy and magic until the facade of machinery covered it entirely. Runes were inscribed onto the bleached bone with Xiangu's blood serving as the ink, infusing the skull with dark mysticism that allowed whoever wielded it to project fear and agony to any and all who were susceptible to the whispers of the dark side. 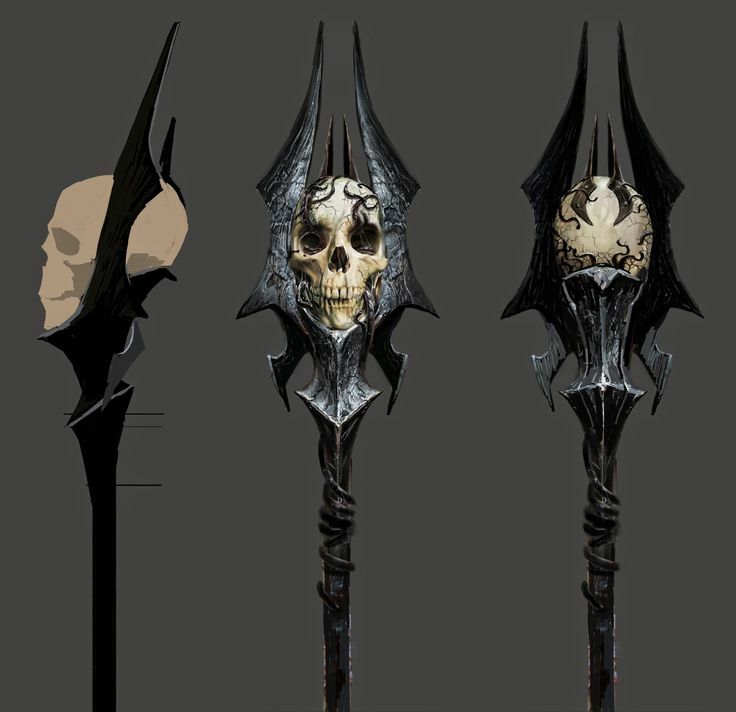 The Staff: The entire staff was wrought from a single chunk of jagged iron wrought by the Dark Lord Carnifex's own hand, infused with carbon and other elements to form steel and shaped after ancient designs dating back to the earliest days of the Sith. It was then bathed in boiling blood and further reinforced with Sith Alchemy to be virtually indestructible by conventional means, even immune to the plasma blade of a lightsaber. Perpetual Force Insanity: The centerpiece of the staff, the Skull of Gaius Zhuta, is imbued with maddening magic that sends out ripples of mind-addling fear to anyone within twenty meters of the staff's wielder. This can cause mass chaos to enemies of weak will, sending them into a fright-induced mania against anything and anyone close enough. War Maul: Because of the staff's size and heft, it can easily crush skulls and buckle armor with a well-placed blow by its traditional wielder, Darth Carnifex. Alchemized Steel: Both the skull and the staff are made of refined metals enhanced by Sith Alchemy to be lightsaber resistant and virtually indestructible by conventional means. Master alchemists can undo the enchantments made to the staff and its accessories over time. Perpetual Force Insanity: While Carnifex would see this as a boon considering his species' immunity to insanity and other mind altering force abilities, the other members of his armies and followers who do not possess this trait are subject to the same maddening properties in the same manner as enemy soldiers would be. To mitigate this Carnifex covers the staff with a Force imbued cloth that dampens the effects to just a couple meters and keeps it locked away until needed. Unwieldy: It's large, it's big, and it's heavy. It's nowhere near the most agile weapon and it takes great effort to slow down or even stop its momentum once it's been swung. This leaves the wielder open to a precise counterattack. Weakness to the Light: Like all creations of Sith Alchemy, the scepter is especially weak against Force Light and can be damaged or even destroyed by continuous exposure. Other Methods Of Mitigation: Likewise, the staff's effects can also be dampened by a Ysalamiri field, Void Stones, or even dedicated Battle Meditation. We have sat on the same councils. We have shared a few words. Out feet have touched the same battlefields. It is my great regret that I do not yet know you as ally. In your hands is the skull of Gaius Zhuta, a pious man who did not accept the Dark when it came to cleanse Maena. I burned him and cleansed him myself, pared the bones clean until the skull was as you see it now. Alchemy set its city to life. It is my blood dried in the runes to fuel the sorcery which makes it the artifact that I gift to you. Even a great lord such as yourself, though not affected by its power, will feel its toxic aura. Carry this in to battle with you and it will destroy your enemy’s minds with fear. Leave it in your throne room to twist those you wish to crush to your bidding. Torture those foolish enough to stand against you by leaving them in its presence. It will waste them away. I have made it no secret that I bow to no man or woman. But it is my sincere wish that this token - created by my hand and with my power, given new life from my own blood - will serve to show you that even if I stand as my own god, that House Xiangu stands by House Zambrano in war and in silence. The Dark Lord deeply appreciated the gift, his mind whirling with all potential possibilities for the skulls use in his service. His mind settled on something practical for combat, as was his forte, and he immediately threw himself into the task of fashioning a staff upon which he would mount the skull. After several hours of tedious forging and alchemical gobbledygook the task was, at last, completed. The Upraetor iv Kiztaga was born. Please make note that strong Lightside powers such as Force Light can weaken and/or destroy the artifact depending on how much time it was subjected to it. Other than that, this is pretty badass, love it. For weaknesses the scepter's powers should be negated by an ysalamiri field and its effects weakened by void stone, and something like battle meditation would be a feasible counter towards the insanity field. Tag me once those things are added and I can stamp it again. Edited by Jamie Pyne, 24 July 2017 - 11:11 AM.